SURIGAO CITY (Updated) -- A 65-year-old woman died while 45 persons were injured in a magnitude 5.9 earthquake that struck Surigao City, Sunday morning, March 5. 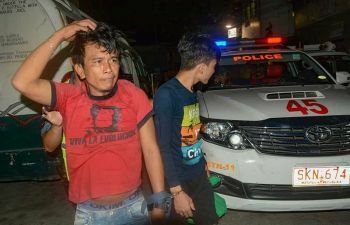 The victim was identified as Socorro Celis, a resident of Narciso corner Lopez Jaena Street, the City Information Office (CIO) reported. Annette Villaces, CIO officer, said responders found her with no pulse when they reached her house. She died of cardiac arrest. As of 6 p.m., Sunday, the CIO reported 42 injured persons of which 31 are an outpatient in Caraga Regional Hospital, one admitted in the same hospital, six are outpatient at the Surigao Medical Hospital while 3 were admitted in the same hospital, according to Anna Dagcuta, Information Officer of the government hospital. One was rescued by the City Rescue Team at the City Hardware. Eleven residential houses and two government buildings were destroyed, City Information Officer Annette Villaces said. Classes in all levels in Surigao City are also suspended starting tomorrow March 6, 2017 as per declaration of Provincial Governor Sol F. Matugas, Villaces said. Power supply was also restored, she added but the public has been alerted on the possible flashflood and landslide due to continuous rainshower brought by a low pressure area. In Barangay Taft, several stilt houses built along the coastline, collapsed injuring several residents. “The jolt sent the entire village into panic, I was almost hit by our television set when it fell, we then immediately got out of our house just before part of the floor collapsed into the water below,” said Jerico Torregosa, 14-year-old resident of Purok 10, Punta Bilang-bilang in barangay Taft. Jovenciano Joria, 54 years old explained that the earthquake hit while they were repairing their house that was damaged by last months quake. “I’m very sad, we tried to save our house after the February earthquake but now the entire floor and the roof collapsed which is far more destroyed. Our concern now again is on how to repair our destroyed our house,” said Joria who added that together with his wife, they were trapped inside their damaged house during the February earthquake. Esterlyn Borimbao, 34-year-old mother of four children explained how frightened she got especially for the life of her children. “I was out of the house when the earthquake struck with only my old mother watching over my children. My three-year-old child fell into the water as our house shook. Thankfully we managed to immediately get her off the water. Almost all of the houses on the water her in barangay Taft suffered either minor or major damage. We fear that some of our need would not be addressed appropriately,most of the houses that are damaged were undergoing repairs when the earthquake struck this morning,” said Borimbao. Broken glassdoor panels at the Surigao City Port were reported by Lieutenant Al Caturla of the Philippine Ports Authority of Surigao. However, he added there were no reported injuries and all passengers and port users are safe. The city Bureau of Fire Protection said an acetylene and oxygen leakage was reported at Narciso P. Reyes Street when the valve of a tank fell due to the quake. There were no injuries reported. A video posted in Facebook by Lorenz Burgos Cadavis, who is from Tacloban City, show the damage in a warehouse of a soda company. Cadavis said he was only visiting the city Sunday when the quake happened and took this video upon leaving the city. Facebook user Che Che Laput in her Facebook post showed their damaged house at corner Narciso P. Reyes street where her relatives including her grandfather, cousin and nephew were trapped. Their neighbors helped rescue her relatives who are now safe. Laput said she is grateful and thankful to God that her relatives are safe and her children were not around the house when the quake happened. "I also am relieved that my children were not there when the quake happened because they are usually around that area where you can see the fallen bricks," she said. As of 7:53 p.m., the Surigao Metropolitan Water District has advised Surigaonons to store water because some areas in the city will experience low pressure to no water from 7 p.m. to 11 p.m. tonight, Sunday. This is due to heavy rains at its water sources that is causing high turbidity. The following areas are: barangays Cagniog, Canlanipa, Taft, Washington, San Juan, Sabang, Lipata, Ipil, Mabua, Panubigon in barangay Lipata, Punta Bilar, Rizal, Luna, Quezon, Bonifacio, Trinidad, Anomar, and Ceniza Heights, Espina, and Capitol. Last February 10, the city and and the province of Surigao del Norte was rocked by a magnitude 6.7 quake that damage about P700 million in infrastructure, killed eight people and affected 1, 790 families. The Philippine Institute of Volcanology and Seismology (Phivolcs) recorded the epicenter of the earthquake 13 kilometers west of Surigao City, at a depth of 13 kilometers. It was felt at Intensity VI in Surigao City, Intensity IV in Limasawa and San Ricardo, Southern Leyte, Intensity III in San Juan and San Francisco, Southern Leyte and Intensity II in General Luna, Surigao del Norte and Ormoc City while an instrumental Intensity VII was recorded in Surigao City and instrumental Intensity I in Borongan, Eastern Samar, and Palo, Leyte.